In the post-Communist political philosophy tradition, the concept of “civil society” (an ostensibly flourishing collection of independent organizations freely able to pursue their interests, ranging from activist groups to bird-watching clubs, from academic institutions to bricklayers’ unions) is distinguished from “political society,” i.e., that dominated by the personnel and ideology of the state itself. While the concept was not originally used in the West outside of specialist circles—in North America, the terms “nonprofits” or “NGOs” are more commonly used to mean essentially the same thing—increasingly, international organizations such as the United Nations (in its Sustainable Development Goals) and especially the European Union have prioritized greater consultation with, and funding of, key civil society organization [CSO] “stakeholders” as part of their engagement with developing nations and partner countries respectively. As far as the countries of the Eastern Partnership (EaP) are concerned, clearly this approach is indeed one where Brussels backs up its rhetoric with bank transfers: the total amount awarded to CSOs in the region has increased nearly fivefold in the past decade. But does this have any impact in helping to promote actual reforms in these countries—and in strengthening EU conditionality—or are critics correct to contend that it remains a rather flawed endeavor? What progress has been made to date, and what changes might take place in the future? Clearly, in the region it is always beneficial to listen to those people and organizations doing work on critical issues—from improving sanitation to assisting vulnerable groups such as at-risk children and the disabled to monitoring transparency in public procurement—and helping them to cooperate effectively both with government and with each other. Simply put, many of these civil society actors do truly necessary tasks in the Eastern Partnership region—and beyond—that governments are often unwilling or unable to do, while doing them more effectively. However, even as outside partners—from the EU and its member states to the US, the EEA countries, and other donors—justly recognize the benefits of this role, they also need to acknowledge that even this recognition brings with it problems of its own. Since civil society has become such a key priority for donors,, government-civil society cooperation is too often marred by a failure to identify the right partners—and to avoid working with those partners that seek to abuse the system. The latter are so commonly found that a series of terms has been coined to describe these organizations—most colorfully, грантоеды (“grant-eaters”), whose budgets feature excessive overhead and salary expenses, and that essentially seem to exist to spend money on overly plush offices along with frequent trips abroad. Sometimes, spotting them is easy enough, whether in the auditing phase or in the execution of projects (when one’s partners insist on putting “time for shopping” slots on each day of a study visit to the West, for example), though in other cases it is less obvious. Such organizations can be very good at “telling donors what they want to hear,” spending lots of time filling out proposals with the just the right buzzwords, while spending little on building ties with the people they claim to serve. (Another term here, drawn from American political vocabulary, might be even more apt “Astroturf” [a brand of artificial grass playing surfaces] organizations, which look from the outside like they have vibrant grassroots ties, but when one looks under the top layer, their less than organic nature is revealed. Of course, spending time on grant applications does not make a CSO a “grant-eater”; on the contrary, the administrative burdens that must be addressed—and the technical resources required—to secure funding from EU sources, for example, actually limits the number of organizations that can qualify for such assistance. To be fair, steps are being taken to try and widen access—through re-granting projects, for instance, where smaller organizations closer to the areas of greatest need are able to qualify for appropriately-sized grants. These and other steps are emblematic of a larger philosophical shift taking place among both donor and partner country governments and CSOs—one that ought to be encouraged. This represents more than just a rhetorical shift, however—but instead, reflects a broader understanding that to work more effectively in their respective spheres, cooperation—rather than confrontation—among civil society and political society is actually the most constructive way forward. In part this is reflects the model established in Estonia, which—as former Estonian NGO Association head (and current Civil Society Advisor to President Kersti Kaljulaid) Urmo Kübar noted back in 2008, has “promoted a strategic approach” to cooperation that has resulted in a “sustainable civil society sector”–of which just one example is the “Let’s Do It” (Teeme ära!) environmental initiative that has expanded worldwide to include some 5% of the globe’s population in World Cleanup Day. In addition to the level of engagement seen in Estonia, the Commission itself has proven much more involved in the sector, and now in addition to citing the total amount of funds it allocates to civil society groups in the region, also notes that its funding has expanded to include some 600 separate organizations in the past three years. In Tallinn this past October, for instance, Commissioner for Neighborhood Policy and Enlargement Negotiations Johannes Hahn, as well as—notably—officials from partner countries such as Belarusian deputy minister of foreign affairs Aleh Krauchanka engaged forthrightly with their civil society colleagues, with the latter conceding that the record of cooperation to date was “not great,” and suggesting concrete ways forward. Another is in the use of digital tools. On the one hand, there is a frequently-encountered argument that digital tools themselves will improve transparency and reduce corruption. (As former Estonian president Toomas Hendrik Ilves is fond of saying, “you can’t bribe a computer.” Yet, the people operating those computers can certainly be bribed—and the computerized systems themselves are often used as attempted leverage in extracting bribery, as the author has experienced while driving in the region on several occasions. Accordingly, there is an increasing awareness that there needs to be broader engagement in encouraging civic organizations to promote and monitor the use of e-governance solutions, while helping to promote the results to a broader public. Otherwise, digital public services may well do little more than allow business as usual to continue—or, worse, to simply make authoritarian regimes more effective. While the ultimate effectiveness of providing assistance to the partner countries both on condition of greater civil society involvement (and of funding CSOs directly) remains to be seen, the positive trends outlined above represent some cause for optimism for a policy framework (and a region) that certainly needs it—especially given the argument that all of the “low-hanging fruit” of potential policy accomplishments has been savored and enjoyed. Emmet Tuohy is senior research fellow at the Estonian School of Diplomacy. In addition to being an EDSN fellow, he is also non-resident research fellow at the International Centre for Defence and Security in Tallinn. 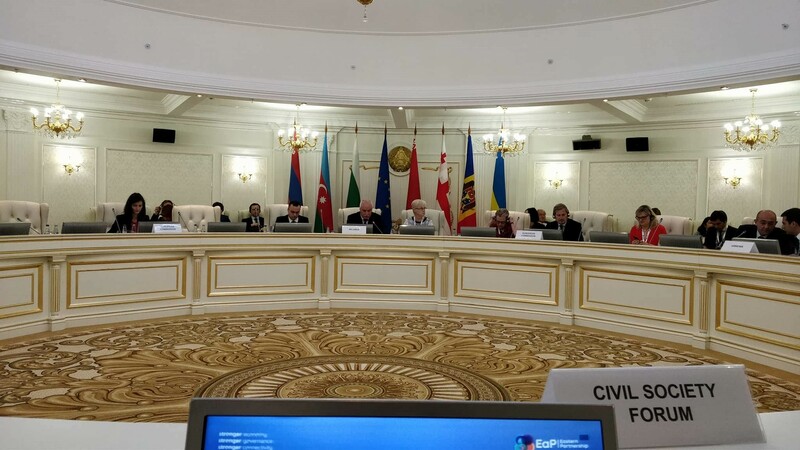 A former senior researcher at the Estonian Center of Eastern Partnership (2016-2018), Tuohy was tasked inter alia with conceptualizing and hosting the 5th EaP Civil Society Conference during the Estonian presidency of the Council of the European Union in 2017. The opinions reflected here are strictly his own. Previous Previous post: Thirty years of war over Nagorno-Karabakh: what are the challenges for democracy?